I wanted to wish everyone a Happy New Year. I'm finally getting around to writing up my "Year in Review." I think this is only the second year I've done this, but it gives me a chance to look back at yesteryear. The big news this year in the concert department was I got to see Rush and the Police. The former I've seen many times, but the latter was something I never thought would happen. The Police stopped by Seattle for two sold-out concerts on June 6 and 7. I went to both shows. The second one was by far the best. Plus the opening band became one of my new favorites, Fiction Plane, fronted by Sting's son, Joe Sumner. Read my full review of the two Police shows. For Rush, I saw them on two different legs of their successful Snakes & Arrows tour. The first two shows were in Washington, one at the White River amphitheater and one at Clark County Amphitheater. I took my seven-year-old son to both (he fell asleep at the second show). Then I did something a little crazy in September: I flew with my friend MonicaZ to Toronto to see Rush twice in their home city and also in the Canadian capital Ottawa. The last show in Toronto was perhaps the best Rush show I've ever seen. It was also great to travel through Toronto and around western New York for the first time. Finally, I saw Porcupine Tree at a sold-out show at the Showbox in downtown Seattle. This is a band I'll continue to watch. Thursday, 10/18/2007 - The Central, with the refreshingly insane 13th Grade. Thursday, 10/4/2007 - The Skylark, with the marvelously hard rocking Megasapien and Key Note Speaker. Thursday, 5/31/2007 - The Rendezvous Jewelbox Theater, with H is for Hellgate. A STIFF LICKS show, an event for Seattle's True Independent Film Festival (STIFF). Performance went down while the film "Repo Man" ran in back of us. Read my blog entry about this show. 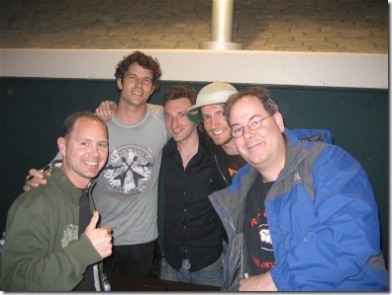 Monday, 2/12/2007 - The Funhouse, with Thankless Dogs and DJ Deutschermeister (AKA Herbie/Roman from The Greatest Hits). Thursday, 2/1/2007 - Cafe Venus and the Mars Bar, a NadaMucho.com show with Supernals and The Diets. NizTV also filmed a video of us there..
Friday, 1/12/2007 - The Skylark (West Seattle), with Never Quiet, Never Still and Seeking Sanity. Chris and I have recently recorded a bunch of new songs that you can listen to on my Chris Mess page. My new favorite local band is Megasapien, with whom we played at the Skylark. Keep an eye on these guys. This year, as I've already mentioned in the Concerts section, I made it to the East Coast to see Rush. As part of that trip, I saw Niagara Falls, Toronto, the outskirts of Ottawa, Buffalo, NY, and the amazing countryside between Ottawa and Toronto. You can read my entire travel blog here. I also made an annual trips with my family to Manzanita and Lake Chelan, two of my favorite places. The year before the presidential election has proved to be contentious. I've seen a few of the candidates in person, who have stopped at my company. So far, the most impressive was Hillary Clinton (read my blog entry about Hillary here). Bill Richardson, Governor of New Mexico, was also a knowledgeable speaker and a good candidate. But, as Governor Richardson himself acknowledged, he's not quite the rock stars as Clinton or Obama. 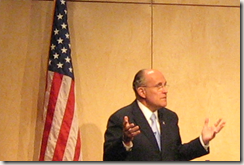 On the Republican side, I saw Rudy Guiliani, who disappointed and annoyed me. 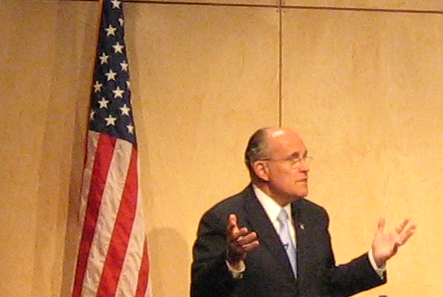 Guiliani started off by telling his audience that the country is going in the right direction. So, if you like what GW has done for America, vote for Mr. Guiliani. You'll get more of the same. At the time of this writing (Jan 11, 2008), he hasn't fared too well in the caucuses in Iowa and New Hampshire, which isn't surprising. In addition, I saw one of Hillary's top advisors, Mark Penn, speak. He was talking about his new book Microtrends, which is all about how small groups of people can add up to be a significant voice (or vote, if you're Hillary). Mr. Penn came up with the now-famous group "soccer moms." I also got a chance to see Michael Beschloss, presidential historian and TV commentator. I had read his book The Conquerors, and I bought his new book, Presidential Courage. The first chapter about George Washington is amazing. On the local side of politics, I had a chance to see Governor Chris Gregoire in a small group setting. Diminutive in size, she is a powerful, passionate speaker whose command of the facts is startling. She seemed to know just about everything going on in Washington State. Like Hillary, Governor Gregoire doesn't always come across well on TV, which is one of the reasons I think she had problems against Dino Rossi in 2004, who is much smoother in debates. Rossi is running again this year on the Republican ticket, but I don't think he'll fare as well now that Gregoire has shown what she can do as Governor.